Welcoming a new puppy into your home is an exciting event. You now have a new member of the family that needs to be looked after and cared for, and puppyhood is a time of rapid growth and development. When it comes to nutrition, puppies require different levels of nutrients than older dogs do - they also eat a lot of food. From their day of birth up to about six months of age, your new puppy will necessitate two to four times as much food as an adult dog to support all of their growth. Think of it this way, after the pup's first week of life, when his weight doubles from what it was at birth, he or she should gain one to two grams per pound of anticipated adult weight each day. Here are four guidelines for feeding a new puppy from a reputable pet food delivery service provider. Due to their unique nutritional needs, your new puppy should only consume puppy food for the first year. Most high-quality dog food manufacturers sell an appropriate formula for puppies which is higher in protein and enriched with minerals, vitamins, and fats essential for growth. If in doubt, ask your vet for guidelines on when your puppy will be fully grown and can, therefore, move on from puppy food. Keep in mind that small dog breeds will mature more quickly than big dogs. 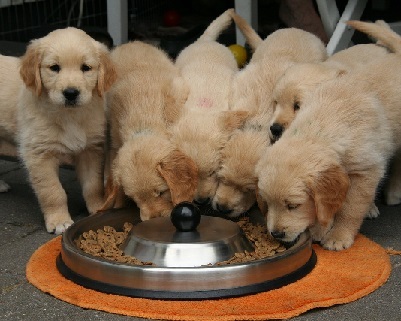 While your new puppy is around eight to 12 weeks old, he or she is probably eating three to four times a day. This isn't necessary, but it is undoubtedly optimal. Feed your dog at set times each day rather than leaving food out all the time, so they learn to keep to a feeding schedule. Once he or she turns six months old, the number of meals you feed him or her should be reduced to two. At this point, you should also start to reduce the amount of food he or she is getting as well. You don't want to put your puppy at risk of becoming obese! When it comes to feeding your dog table scraps, the best course of action to take is never to start. Seriously, once you start, your puppy will never allow you to stop. Studies show that dogs which consume high-quality dog food are nutritionally better off than their owners! Dogs at all ages require a balanced diet that is very different to what humans need. Your dinner doesn't include the vitamins and minerals that dogs need, and it can cause diarrhea or other gastrointestinal problems for your four-legged friend. While they will happily eat most of what you give them (and it will fill them up), you are still denying them the chance to ingest the nutrients they need. Moreover, there are plenty of human food products that aren't safe for your puppy. 4. Understand the "Picky Eater"
It can be agony to watch your puppy or dog not eat, but remember that dogs don't starve themselves willingly. So even if your puppy seems stubborn, if you leave food out for him or her, they will eventually succumb to the hunger and dine! Don't give in to your puppy's protests and their changing day-to-day feelings about their dining options. Dogs will happily eat the same food every day of their life - unlike humans; they do not want nor need a lot of variety. However, they do crave a tasty, nutritious meal. Usually, picky eater dogs happen as a result of humans regularly feeding them scraps from the table, or being overly generous with treats throughout the day. While it may not seem like a big mistake at the moment, these small things can be the most damaging to your new puppy. Don't buy food created for a small breed puppy and give it to a large breed type. Don't buy whatever dog food is on sale - just because it is on sale. If you are a first-time pet owner and you are worried about how to take good care of your puppy, checking a puppy food chart can help. Additionally, to ensure your pet's health and happiness, make an appointment to speak with a reputable vet.